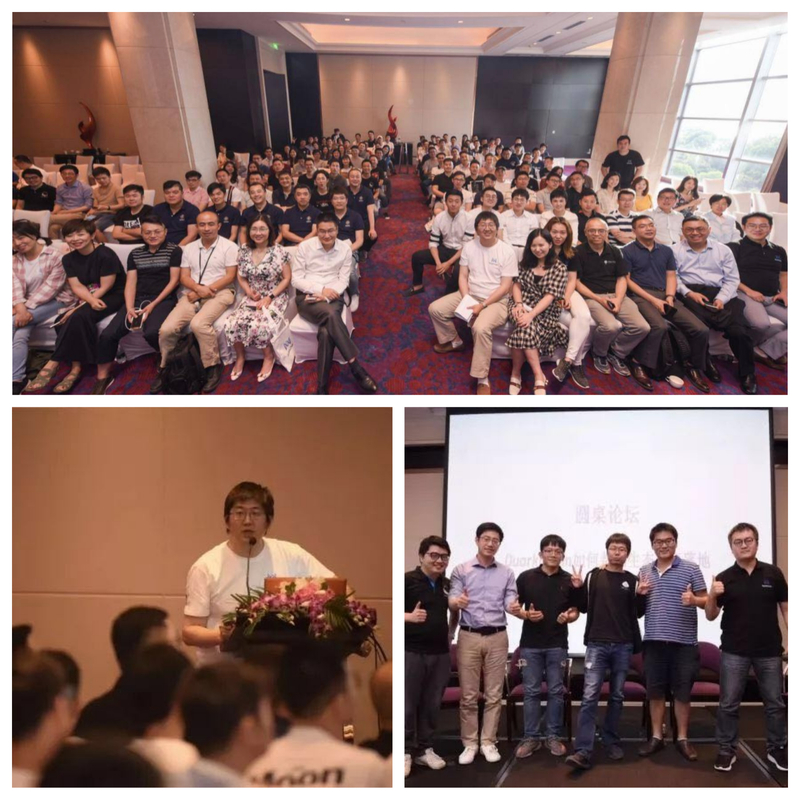 On June 17, QuarkChain and Chain Capital successfully held their first Chinese meetup during the trip in Shanghai, China which drew hundreds of participants. Investors, partners, medium, and community members from all over the world gathered in the Kempinski Hotel and discussed the applications based on Quarkchain’s high-performance public chain. The attendees of this meetup include: QuarkChain CEO, Qi Zhou; the Co-founder of PreAngel, Lijie Wang; the CEO of Covalent Chain, Le Kuai, Merculet’s Mengju Jing, Tripio’s Wei Shen, Playtable’s Shangjie Zhu and other capital investors, including Fenbushi Capital’s Ming Sun, PreAngel’s Lijie Wang, Bodhi’s Xiahong Lin, Chain Capital’s Xiangmin Li, Direction Capital’s Juewen Liu, Bisheng Capital’s Jianliang Shao, JRR’s Czhang, Future Money’s Eo Hao, Steven Li, D11 Capital’s Kelvin Yeung, Dragon’s Yuehua Wang, Jisu Capital’s Lie Wang and Ten Dimension’s Jun Zhang. Media partners, including Coin Time and Deep Chain, also supported this meetup. As a technological revolution sweeping the globe, blockchain has been called the “next generation of the Internet”. Nowadays, blockchain has been applied to supply chain, finance, shipping, logistics, and stock trading. The combination of blockchain and manufacture has become the new trend in future industrial development. Although blockchain has been ranked as one of the most revolutionary technologies, there are still tons of open problems facing this developing technology. Limited data storage and transaction concurrency, immature consensus, the limited capacity of blocks, and opaque legal definitions have become bottlenecks for the progress of blockchains. During his speech, QuarkChain’s CEO, Qi Zhou mentioned that he has started investigating blockchain technology for a long time. He said after two generations’ development represented by Bitcoin and Ethereum, current blockchain technology is facing the problem of low concurrency in pubic chains in terms of deployment. Thus, low-performance public chains have become the bottleneck to hinder blockchain’s further technological development. Before 2008, tech companies like Sun, Oracle, and EMC wanted to scale by building a single expensive machine to realize centralized scalability, known as “vertical scalability”. However, after 2008, tech companies such as Google and Facebook put forward a revolutionary approach known as “horizontal scalability” which increases the number of machines instead of the computing power of each, and improves the performance of the network as a whole using sharding. One advantage of horizontal scalability is that it scales easily as demand on the network increases. QuarkChain’s founder and core engineers were all experts in distributed systems at Google and Facebook and have carried this principle over into scaling distributed systems. This approach has made it possible to achieve more than 100,000 TPS without sacrificing decentralization and security. High throughput public chains will lay a solid technological foundation for high-frequency trading, advertisements, IoT, AI, big data, and gaming. In addition to what has been mentioned before, QuarkChain technology also has many advantages over the existing ones in efficient account management, safe sharding transactions, and smart contract compatibility in its system infrastructure. Leo Wang, founder of PreAngel mentioned that he transitioned from equity investment to blockchain investment because of the investment opportunities here. He has invested in many excellent startup projects. In 2014, Leo started stepping into the blockchain arena and invested in some startups such as NEO and Oben. Since then he has devoted himself to the blockchain industry and has performed deep industry research. He believes that the main difference between the Internet age and the blockchain age is that the internet is mainly about information transmission while blockchain is focused on enabling online asset transfers. Based on this observation, public blockchains are a worthwhile investment. The value of a public blockchain solution is like a country, while building its ecosystem is like building its own empire, and the value of dApps and protocol layers are like corporations. However, due to the lack of high performance public blockchain, most dApps cannot be implemented currently. In the future, blockchain will become an important technology to promote the transfer from information internet to value/asset chain. In addition, he also clarified that there have been some air coins (i.e., fraudulent blockchain projects) in the past two years. He believed that the government’s regulation of cryptocurrency and blockchain technology is necessary. He hoped that future regulations will bring the blockchain industry into a better world to develop, explore and innovate new technology. Covalent Chain is a business data platform based on QuarkChain technology and will build a new trading ecosystem for high-efficiency information exchange and secure data sharing in the B2B field. Covalent Chain’s CEO, Le Kuai, discussed the problem of opaque information and the low-cost of integrity in the B2B field. He thought the complexity of commodity and trust relationship between two sides are the main factors in transactions. Blockchain holds tremendous potential for decentralization, rebuilding relationships, and opening up data to the public. This makes B2B industry, which urgently needs to use blockchain technology to solve related problems, become a very hot topic. He also announced the technical partnership between the QuarkChain team and Molbase B2B platform. During the final round-table discussions, QuarkChain’s CBO, Ting Du, Merculet’s Mengjun Jiang, Chain Capital’s Xiangming Lu, Bodhi’s founder, Xiahong Lin, Tripio’s CEO Wei Shen and Playtable’s Shengjie Zhu sat together and brainstormed about how QuarkChain can help in building ecosystems. Bodhi’s founder, Xiahong Lin said that having a high throughput system is crucial for prediction markets. Take the ongoing World Cup for example. It draws a huge number of soccer fans to buy match lotteries, which reflects a high-demand market in a high-performance web system. QuarkChain has an overwhelming advantage in high-performance infrastructure and he is looking forward to QuarkChain’s main net launch. Playtable’s founder, Shengjie Zhu said that the game experience can never be improved without the high-performance web. Playtable suffered a lot of game delay when developing their early stage products. However, after reviewing QuarkChain’s code, Mr. Zhu said he was impressed by QuarkChain’s main net and believes it can provide Playtable with delay-free system support. Wei Shen, the CEO and former Vice President of Tripio, said that their platform needs to handle millions of transactions per second. QuarkChain’s technology lets them build a brand new travel ecosystem plan to ensure the safety, decentralization, and speed of online data. Merculet’s Jiangjun Meng and Chain Capital’s CEO, Xiangming Li, said QuarkChain’s high-performance public chain is deployable in all fields of life and has promoted the development of the blockchain ecosystem. Besides, QuarkChain is working on a fundamental public chain that can realize horizontal scalability and trans-chain and trans-block transactions, which will provide many opportunities for the whole blockchain ecosystem. The QuarkChain team also gave detailed responses to questions from the audience about the community operation and development plan, which strengthened the audience’s confidence to the deployment of QuarkChain projects. QuarkChain is the first public chain that supports state sharding, Turing complete smart contracts, and also clusters of ordinary computers.